Ah, we've reached the end of 2013. Finally. After 12 long months. 365 grueling days of failure and triumph, winning and losing. It's been quite the ride in the world of sports this year, and it's time to look back on the best, and the worst moments and performances over the past calendar year in the world of sports. Let's begin with some of the smaller awards. Houston Texans. Everything just fell apart for this team which looked like a Super Bowl contender in the preseason. Matt Schaub regressed mightily, and the team had to eventually bench him for undrafted Case Keenum. After starting 2-0, they lost 14 straight, even having to fire their coach, Gary Kubiak after their Week 14 loss. Charlotte Bobcats. They didn't have the worst record in the 2012-13 NBA season, but they certainly were less talented than the Orlando Magic. They were just bad; there wasn't much talent, at least before Al Jefferson showed up, and the pieces didn't fit well at all. Fun times. Florida Panthers. Awful goaltending and defense and, outside of Kris Versteeg, Tomas Kopecky, and Jonathan Huberdeau, inept offense led to the Panthers having the fewest points in last year's lockout shortened NHL season. So, I picked the Dolphins last week in Buffalo. I had a bit of trepidation as I was writing that, but, I felt better about them than taking the Bills to cover. So what do you know? They decided to score 0 points. Thanks. In usual Cowboys fashion, they won, but figured out a way not to cover against an awful Washington team. I came out with a one point win in Carolina, which also propelled them to the second seed in the NFC playoffs. Once again, rolling with the Jaguars had great results for me, as they got me a one point victory as well. I'm so incredibly done with the 2013 Lions. At least the Cowboys have a chance to salvage their season, and they didn't benefit from having the starting quarterbacks of both the Giants and Eagles get hurt for a good amount of the stretch run (well, Eli Manning may as well be hurt the way he's playing). 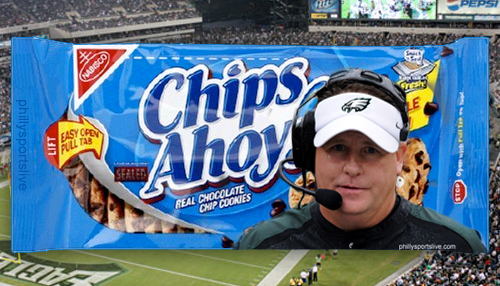 Jim Schwartz should never get another head coaching job in the NFL. It's a disgrace that this Lions team, with all of its offensive talent, and one of the best defensive lines in football, should be 7-8. With their playoff hopes on the line, they lost in the Giants. Wow. I'm not saying I called the Cardinals beating the Seahawks in Seattle last week, but I did say that they should keep it close. And that deserves some credit, right? Speaking of keeping it close, the Ravens didn't against the Patriots. Unfortunately, I picked the Ravens in that contest. But, to balance it out, I picked the Eagles in what turned out to be a complete blowout. I went 8-8 last week, putting me at 123-112-5 on the season. Let's end the year on a high note, and send it into the playoffs with some momentum! Jets: One final time this year, the Jets have listed an ungodly number of players as probable. They're all playing. Whatever. I went 9-7 last week, which may have been one of the weirdest that I have experienced in terms of my picks. First of all, the Broncos losing outright to the Chargers in Denver is pretty weird, and impossible to predict. Then, in what I thought was a pretty easy game to call, the Patriots lost to the Dolphins. I understood why the Dolphins were favored, because, the Pats aren't as great without Rob Gronkowski, but at the same time, I didn't expect the Patriots to lose. By the way, how 'bout them Dolphins possibly making the playoffs? Of course, one of the weirdest results ever took place in Minnesota, with Matt Cassel throwing for 382 yards, while third string running back Matt Asiata scored thrice, despite averaging only 1.7 yards per carry. Now, tell me, what the hell was this? 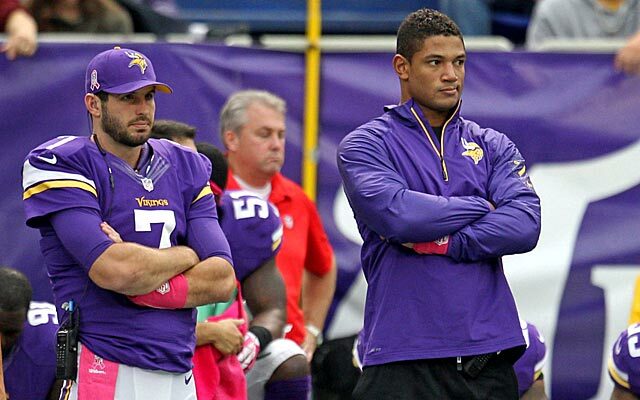 The Vikings, whose quarterback situation has been about as stable as 2011 Charlie Sheen, and were missing their top two running backs, one of whom being reigning MVP, Offensive Player of the Year, and someone who is in the discussion for the most unstoppable force in the history of the league, and literally the only player on the offense that scares other teams: Adrian Peterson. And somehow they 48 on, albeit a bad Eagles defense. I don't understand that, and there's not much more I can say about that game other than the fact that apparently logic was too lazy to make its way to Minnesota on Sunday. The Saints game wasn't shocking, but certainly unexpected. The Rams are one of the most inconsistent teams in the league, and the Saints are simply a worse team when they play away from New Orleans. Then, Andy Dalton turned into Bad Andy Dalton and the Bengals were down big early on Sunday night against the Steelers. That was another pretty unexpected loss, but again, not shocking. This was a disgraceful performance by the Cowboys in the second half. I know you've heard it all week, but there's no reason why, with star running back Demarco Murray averaging 7.4 yards per carry, and a 23 point lead on Matt Flynn and the Packers, the Cowboys stopped running the ball. This isn't an issue of trusting Tony Romo or not, but rather, common sense and clock management. Then there's Monte Kiffin's defense. What a joke that has been this year, culminating in allowing Matt Flynn to put up 34 points in the second half. That may have been the most disappointing 30 minutes in recent football history, and Dallas should be embarrassed by that display. The team is too talented to be so mediocre, and the only person to thank for that is Jerry Jones. Jason Garrett is done after this season. That is, if Jones were smart enough to get rid of his guy. But don't put anything past Jerry. There was so Thursday night game this week, so I'll jump straight into the Week 16 slate. Currently, I stand at 115-104-5 on the season. I'm well on my way to a +.500 year, which is pretty good. Shall we? I expected the Jets to control the game last week, and the fact that they did was a great sign for the rest of the year and their future. Geno Smith still made some horrible throws, but at the same time looked like not only an NFL quarterback, but a pretty good one, for most of the game. It was great to see him shake off whatever had been plaguing him the last few weeks and pull out a performance like that. He showcased all of his skills: his deep throw ability, his accuracy, and his mobility. That doesn't necessarily mean that he won't fall into another slump this week, but rather that he has the bounce back ability that an NFL quarterback requires. He regained his confidence, and it showed. Geno leads his Jets into a very tough matchup in Carolina this week, against the second best run defense in the league, and a team that forces a lot of turnovers. That doesn't bode well for the Jets, because that means that Geno Smith will have to play great to have a chance in this one. 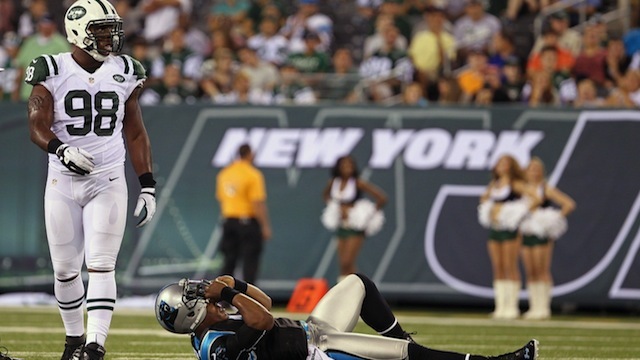 As for the Panthers side of the ball, the Jets have the best run defense in the league and it's not very close. Credit Rex Ryan for putting together such a dominant defensive line to give his team a major strength. They do at least one thing at an elite level, which is more than can be said about most teams. Luckily, that strength will be in full force today because the Panthers are better when they are running the ball. Cam Newton is great at both passing and running, but outside of Greg Olsen and Steve Smith, who has been pretty inconsistent this year, he doesn't have much by way of weapons. Certainly, he has big play ability, and as I've said, the Jets are vulnerable in that area, but there's no guarantee. Overall, the Panthers are one of the best teams in the NFL. But, as for today, the Jets have the ability to stop the run better than anyone else, creating a bad matchup for the Panthers. This will be closer than you think, but still a Carolina victory. Tonight's Pick: BRONCOS (-10) over Chargers. Naturally, I start off the week with an outright loss. that puts me at 10-7 on Thursdays, and 106-98-5 on the season. Let's get on with it. Jets: I'm not falling for your shenanigans Rex Ryan. Just wanted to tell the world (at least the .00000000001% that is reading this) that I got 97 points from two players last week. It's a PPR league, so that inflates the numbers, but still. Keep looking at that. Feast your eyes on the glory. As you can see, despite the performances of Gordon and Jeffery, their teams lost. I got the Browns game right, because I knew to avoid the Stench of Wheeds. As for the Bears...I don't know what to do with them. Speaking of not knowing what the do, my Jets are disgusting right now, and have a quarterback controversy. Again. I got a bit too cute picking the Rams to cover in San Francisco. Oh well, they're so inconsistent that it was certainly possible. My Pick for Tonight's Game: JAGUARS (+3.5) over Texans. Why? Just...why are the Texans favored over anyone? Turns out, I was right. With some help from the Case Keenum-Matt Schaub combo, the Jags won. Unfortunately, that win seemed to take them out of the running for the first pick in the draft, having swept Houston this season. They're too bad to not go all out tank mode for Teddy Bridgewater. That win brings me to 10-6 on Thursdays, and 99-89-5 on the season. At least I'm not losing ground, but it's time to make a run. Now, this is a loaded question that I'm grappling with in this article. The best Met of all time... What exactly does that mean? 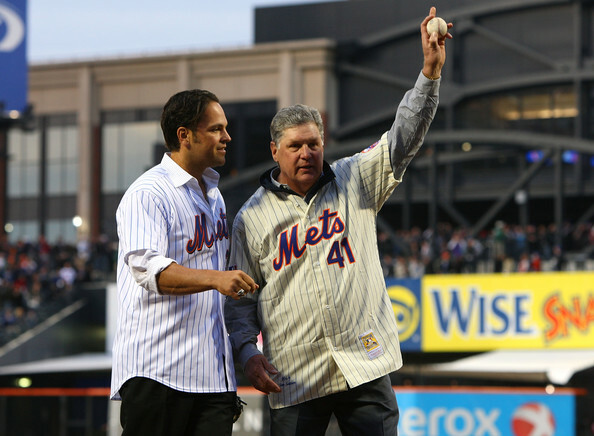 Is the best player ever to have played for the Mets? I don't think so, but that answer would be Willie Mays. Is it the most talented player to don a Mets uniform? In which case, despite going downhill so quickly, you could say it's Doc Gooden. Should the player have spent all of their career with the Mets? Because, well, then that takes away most options, leaving us with David Wright and Ed Kranepool. So my definition that I'm working with, is, a player who played a significant amount of time with the Mets (seven years sounds about right), and had a great impact on the team's success. So, that rules out the late great Gary Carter, as well as Carlos Beltran, Jason Bay, and of course, Bartolome Fortunato. But it does leave Bill Buckner, as he was the single most important part of the Mets second championship. Thanks Billy! So, I started off pretty poorly last week, whiffing on my Bears, Jets, and Browns picks. But, to be fair, Brandon Weeden played for the Browns. In fact, I posted that on the facebook page, the Return of the Wheeds shouldn't count against me. Why should I be penalized because no matter what the Browns do, the Stench of Wheeds always comes back to infect their games? LIONS (-6) over Where Art Thou Aaron Rodgers? Detroit is inconsistent, but they can't lose to Matt Flynn...can they? They surely showed that inconsistency on Thursday. They were down early, but ripped off 37 straight points to win the game, and more importantly, give me the victory. Raiders (+9.5) over COWBOYS. ALL IN ON THE MATT MCGLOIN BANDWAGON! LET'S GO! They should lose, but keep it close. A legendary backdoor cover here. They started off great, and held a 21-7 lead until the last 10 seconds of the first half. From there, Oakland fell apart, and fell behind by 10, with 1:56 left, which would have been a heartbreaking defeat. But then, Sea Bass saved the day with a 45 yard field goal. They needed a touchdown, an onside kick, and a field goal to tie, and while they only got one of those three things, the Raiders will live on in my hearts for that incredibly clutch cover. All hail the kicker taken in the first round! Flacco played pretty well, but of course, I lost. By half a point. Come on, back in Week 7, the Ravens lost by 3 to the Steelers, failing to cover the spread by.....half a point. So in two Ravens-Steelers games this year, I'm 0-2 because of a combined 1 point. Awesome. This puts me at 9-6 is Thursday games, and 93-82-4 on the year after a .500 Week 12, in which I went 7-7. I'm now safely over .500 for the year, but don't get too confident, there's still a way I can mess it up. Jets: 13 guys listed, my limit is 10. 13 happens to be greater than 10. So, I'm not typing all those names out when their gam status was never really in doubt. What an annoying week for me. I lost the my Buccaneers pick by 1 point, and I lost my Ravens pick by half a point. And if that weren't enough, Jay Cutler got injured in the first quarter, and Josh McCown actually played well, giving me hope that I would get my pick right. Then of course, Roy Helu scored a touchdown with 45 seconds left to win the game and hand me a loss. So thanks for the false hope Josh, if you had played terribly that would have been my excuse. Also, I started Cutler over King Kaepernick on my fantasy team, and I still won with my -1 points from the QB spot. Speaking of last second losses, Brandon Weeden had the ball with 1st and Goal on the Packers 7 yard line, down by 18. The line just so happened to be 11, so if he was able to punch it in, then I would have mercifully escaped with a push. So what does Weeden do? Turnover on downs of course! And so ends the Brandon Weeden era, because he was officially benched this week. I will not miss him. My inconsistent Jets decided to show up last week. Which I should have expected, because they have alternated good and bad games all year. It's so hard to anticipate what they are going to do in any particular game. 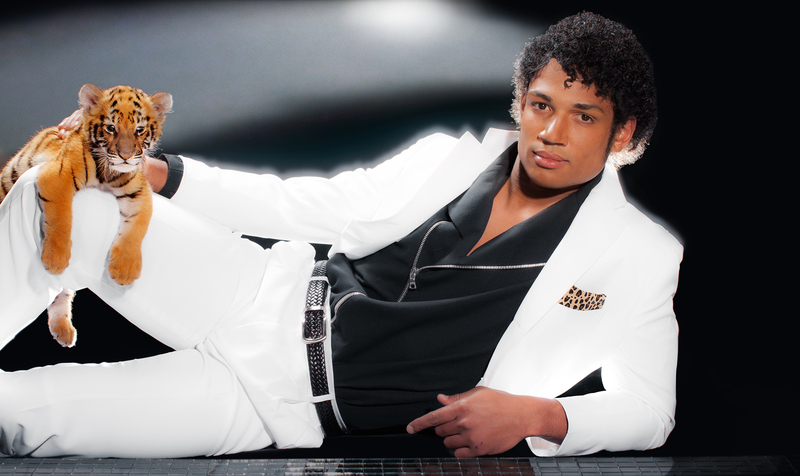 Boy was Josh Freeman awful. That was Gabbert + Weeden level bad. Yeah, he played like the disgusting combination of those two useless quarterbacks. Blaindon Gabben? 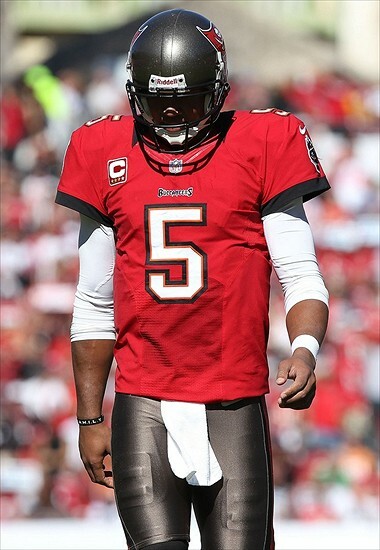 That's how bad Josh Freeman was. And I'm still not breaking up with him. I can't take the pain that comes with the 0.37% chance that he returns to form and becomes good again. Onto this week, where I can take solace in the fact that I got my Thursday night pick correct. My Pick for Tonight's Game: Panthers (-6) over BUCCANEERS. I don't feel great about it, but I feel good enough. Well I felt pretty damn good about it pretty much as soon as the game started. The Panthers are good because their defense is so great. Specifically, it is their front seven being so good, and therefore having the ability to mask the weaknesses present in the secondary. It's working, and the Panthers have a shot at the playoffs this year. So I'm 6-2 on Thursday night games, and 55-52-2 on the season. I have no idea how I'm still over .500 with the awful streak I've been on lately. Let's do this! Jets: More frustration. Eleven guys are listed, I'm setting the limit at ten. Rex is trying to Out-Belichick Belichick. CB Dee Milliner (hamstring) is back. There are so many key components for every quality basketball team. There's the star player. The go-to guy who will always be relied upon to get a key bucket late in a game, and should be able to do everything else on the court. Then there are the various role players who can each do different things that help the team. There's the facilitator, who creates open looks for everyone else. There's the scorer who provides a quick spark off the bench and maybe he can even take over for a while. The lockdown defender is supposed to stick on the opposing team's best scorer and shut him down. 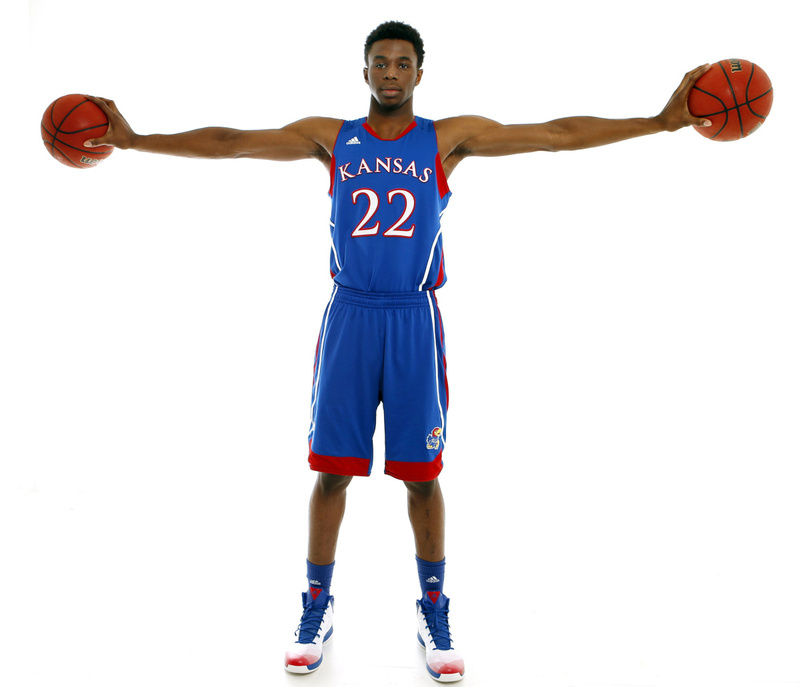 The defensive big man should be able to clog up the paint, alter shots, and grab boards. There are so many pieces that go into the creation of a quality basketball team, and the Knicks have all of them. Thank you to the Detroit Lions for deciding to wait until after I posted my picks to decide that Calvin Johnson wouldn't be able to play. I really appreciate that. I also really appreciate the fact that the Lions are completely worthless without him. I'm seriously wondering if the Jaguars should remain an NFL team. They failed to cover a 12.5 point spread against Sam Bradford and the Rams. May I remind you that these are the same Rams who were dominated for the first half in Week 2 (before a comeback that didn't really have a chance) by the otherwise winless Atlanta Falcons. These are also the same Rams who were blasted by the Cowboys and 49ers in the next two weeks. Just demote them to the CFL, or the SEC. Shouldn't they just forfeit every game (especially this week, we'll get to that) so that their fans don't have to watch them and TV stations don't need to apologize for broadcasting them...in Florida. But of course, my favorite part of last week is that one of the few games I got right involved my Jets. I don't know how they did it, but they won. They beat the Falcons in Atlanta thanks to a beautiful drive by Geno Smith at the end of the game. In fact, read the whole tweet. I was wrong not only on the game, but in saying that the Bears are good. They have a lot of holes that were shown off on Thursday. And while they still won because they were facing a bad football team, but they have an inconsistent defense that can only do well if they are causing turnovers. And they were causing turnovers here, but they still failed to cover this spread. So now I'm 0-1 on the week and 41-35-2 on the season after a bad 5-9 week that looked even more abysmal at around 7:30 PM last week when it was sitting at 3-8. Thank you to the 49ers and Jets for saving me. I started off pretty well last week, with the Seahawks coming back from a 20-3 deficit and beating the Texans in overtime on the road to make me happy, and cause all those who picked the Texans to curl up into a ball and cry. I ended up with a 9-6 record, which is pretty good, and keeps my streak of weeks without a sub-.500 finish at nine straight dating back to Week 16 of last year, including the playoffs, and excluding the Super Bowl. Jeff Tuel brought his 4-22 college record into the game and got outplayed by Brandon Weeden. Those are the saddest five words ever written. Thanks to Tuel being bad, I snuck away from that game with a victory. Shoutout to Kiko Alonso for being ridiculously impressive in each of his first five games. 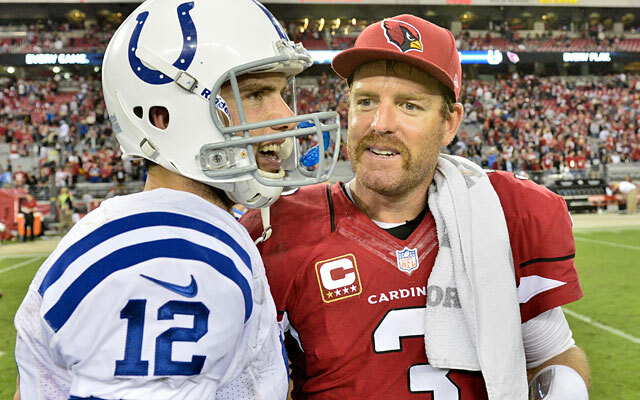 Thank God I decided not to watch this abomination of quarterbacking. I'm now 4-1 on Thursday night games, and 37-25-2 on the season. Let's continue the run! UPSET ALERT next to games in which I think the underdog will win outright, not just cover. Hoem team in CAPS. Jets: It looks like this is going to be a recurring theme as the Jets listed 11 players as probable. I'll just give you the highlights and not waste your time, DT Kenrick Ellis (back). The rest are people who you probably haven't been concerned about this week. 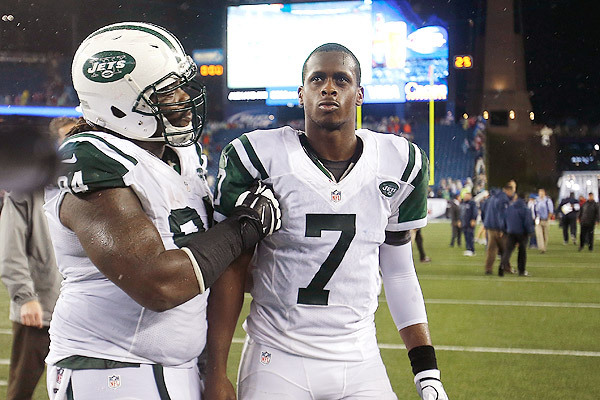 Even Geno Smith is on the injury report. Give it up for Rex "Belichick" Ryan. I'm not too happy with the people in this world who bet. When I made my pick for the Monday night game, the line was Broncos -16. By kickoff, the line had crept up to Broncos-16.5. So, naturally, I picked the Raiders to cover the 16 point spread, and they lost by...16. So I really could have used that extra half point. Thanks a lot. As you may already know, the Niners got back on track after an awful showing against the Colts by walloping the Rams 35-11. And it wasn't even that close. The Niners are fine, but the Rams look like they're in trouble. Anyway, I'm now 3-1 on Thursday night games, and 28-19-2 on the year after a great 11-4-1 Week 3. Hopefully my good luck continues. I did not do a preview for last week's game because I had way too much work, and it would have been impossible for me to write it on a Thursday. The Rams almost pulled off one of the most miraculous backdoor covers in history. Down 24-3 at halftime, they ended up losing 31-24 in a game in which the spread was 6 points. That was balanced out by the fact that the Ravens, who struggled mightily all day, and were down 6-0 at halftime, somehow covered the 7 point spread that they had no business covering. They played horribly, but then again, they were facing Brandon Weeden. 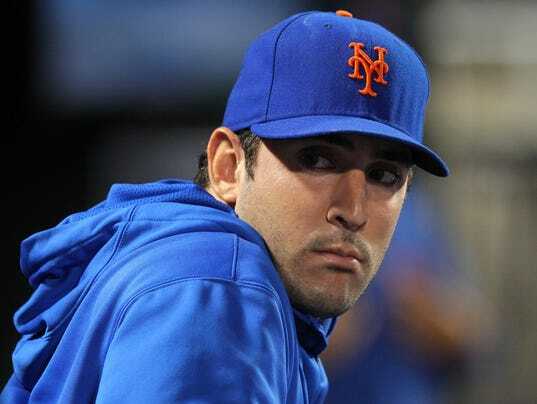 So this week, Mets star pitcher Matt Harvey decided that he would not have Tommy John surgery and instead try a six to eight week throwing program before revisiting this possibility. Read the story on espn.com, I'll wait. No, seriously, I don't want to waste too much time re-telling the story. I'm still quite angry that the Texans failed to cover the spread. I missed that one by half a point. Well, you win some, you lose some. That one was pretty easy for me. As soon as Danny Amendola was ruled out of the game, I still felt that the Pats would win, but my Jets, despite having a completely inept offense, should cover the spread. I don't know what the spread was on Monday before Vereen and Amendola were listed as out, but I would have hoped that there was a lot of action on the Jets. 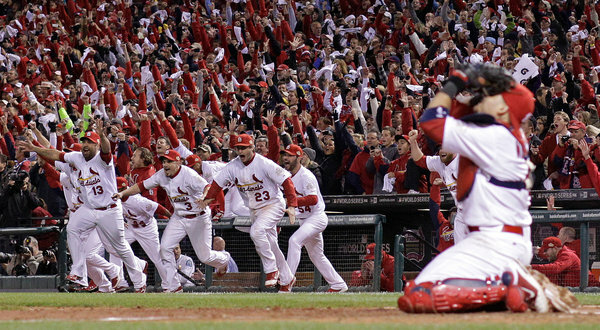 Anyway, that puts me at 1-1 on Thursday games and 9-7-1 on the year. We're two games into the New York Jets season, and therefore, we're two games into the career of Geno Smith. Drafted 39th overall and the 7th pick in the second round of this year's draft, the Jets drafted him to be their franchise quarterback. Maybe not immediately, but a few years down the road. At the very least, they wanted to get him some in-game reps throughout the year and see what they have. 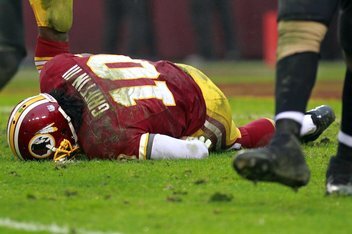 He was "competing" for the starting job in training camp, but was officially handed the role when Mark Sanchez got hurt. Personally, I think that in reality, Smith would have gotten the starting role even if Sanchez were healthy. After two games, I believe that he certainly is an interesting talent. He can move pretty well in the pocket, and he's been great at picking his spots in terms of scrambling for positive yardage when the coverage doesn't allow him to make a play downfield. He also has shown pretty nice poise in the pocket. In the preseason game against the Giants, he collapsed under pressure and sometimes he panicked. As for throwing, he needs work, but at his best, he can make very strong and accurate throws. However, that isn't the norm for him. Especially on Thursday night against the Patriots, Smith was overthrowing receivers, underthrowing receivers, and occasionally it looked like he was attempting to target the defender. He missed quite a few throws that should have been easy. He played bad. So why do I think he's so interesting? Because, he's only a rookie. While a lot "rookie mistakes" become simply mistakes, I still think that he can improve greatly and be much more consistent. That's the key word, consistency. That has always been the biggest issue with rookies in the NFL. They show flashes of brilliance, then follow it up with an "I don't belong here" play. Geno has been doing that. I think that he has the potential to be among to the top ten quarterbacks in the league in a few years, which will be good enough to lead a team to glory given that the surrounding parts are good. Throughout this season, he will continue to make better decisions, and gradually, his accuracy will improve. It will take some time, but this project is probably going to work out well for the Jets. I think they're onto something. Oh you think that was enough? In 140 characters, I not only found a way to call out the oddsmakers for the line being so large in favor of the Broncos. It doesn't stop there, I followed it up with this. Not even the worst of my problems, as Julius Thomas put up 28 points on my fantasy bench. Not a banner night for me. But hey, after a pretty bad 125-133-4* record, compounded by the fact that I apparently can't count, seeing as I have 6 more games on my record than there are in an NFL regular season, it can't get that much worse, right? Remember, the Week 3 Fail Mary cost me a game and I'm only going to let go of that grudge now. Mostly because there's no reason for me to ever bring up my 2012 record again. 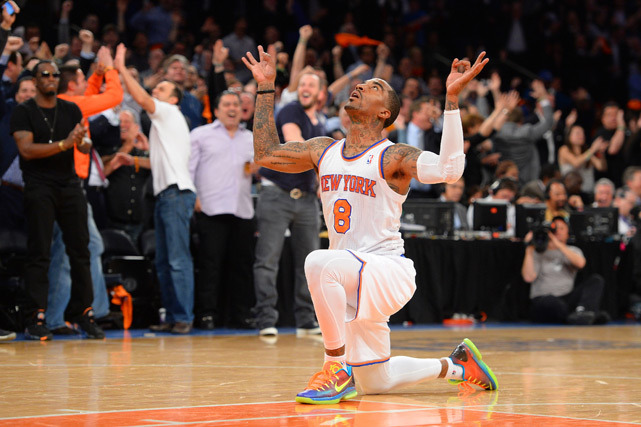 I mentioned back in April that I am now a writer for the popular website New York Knicks Memes. Well since I've returned from Ghana, I have accepted roles as a contributor to New York Sports Hub, and as an editor/senior writer at SportsDorks, which was founded by my boy Charlie Fogg. Check out all the other content on both websites, there are a lot of great writers contributing there. All this means is that pretty much everything I post here will be seen elsewhere. I shan't abandon you all. This will become a little more of an index of my work than my only project. Anyway, thank you for the support, thank you to Charlie (from SportsDorks) and Ankit Mehra (from New York Sports Hub) for the new positions, and I look forward to big things in the future. Read Part 1, the Power Rankings, here. I also, however, was one of the few people to correctly predict that the Saints would be average without Sean Payton, and I was fairly close with the Steelers. Trust me, I will never stop talking about this one, I correctly referred to Colin Kaepernick as the "best QB on his team" and that "for the sake of the Bay Area, I hope [he takes over as starter] this year." That brings me to the part where I picked the Ravens to be in the Super Bowl. Don't forget me picking my boy Luke Kuechly to win Defensive Rookie of the Year. I'll have the full division and conference playoff standings tomorrow. Along with the playoff predictions, Super Bowl predictions, and award predictions. All of that will be coming in Part 2. But for now, I have a list of each and every one of the 32 NFL teams. I'm going to now take that list, and order it from 1 to 32, from the best team in the league, to the worst team. The records that you see tomorrow will not be fully indicative of what I think about each of these teams, because when it came to filling out the schedule grid, factors such as strength of schedule came into play and may have skewed some records. 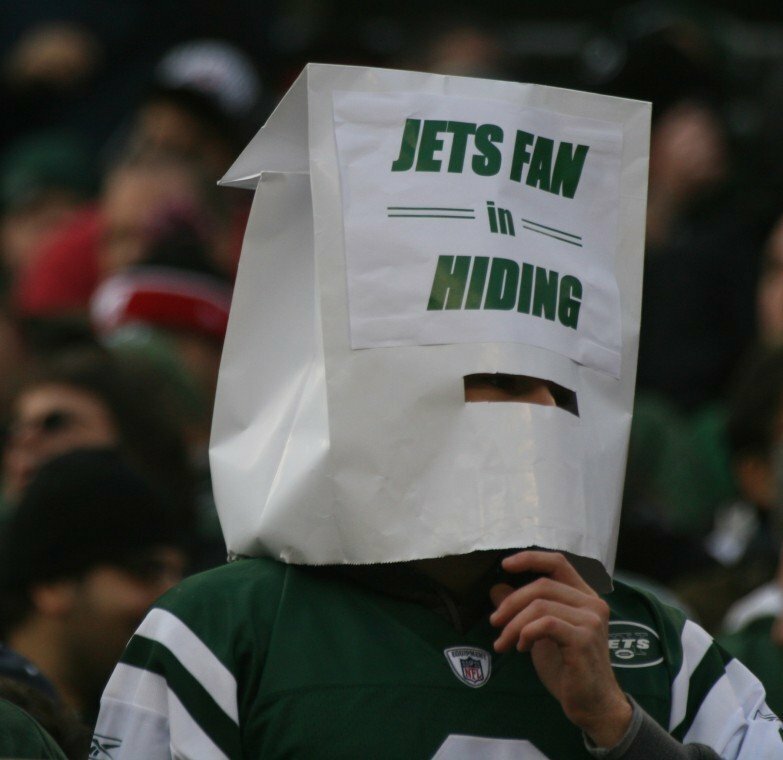 Well, it's that time again, for my damned Jets to take the field again. I've already written once about how it feels to be a Jets fan in 2013, and let's just say it's not fun.This team is not going to be very good, but somehow they're going to stay in the national spotlight for the whole season despite being worthless. I actually think Rex Ryan is a very good coach, because now it seems that Mark Sanchez is putrid, which means that Ryan took a putrid QB to the AFC Championship Game twice. It's not his fault that Mike Tannenbaum did not even try to make it look like he cared about keeping the roster together past the year 2012. And well, look what happened. Anyway, Ryan is going to be fired at the end of this year, and frankly, I don't think he cares. Teams are going to be lining up to lure him to be their head coach in some cases, or if he wants to join a winner, say the Green Bay Packers, he can catch on as their defensive coordinator. It will be a mistake if the Jets let Ryan go, but it's going to happen. Oh well, you can't win every battle. Speaking of which, let's talk about the team that won't win many battles. At all. The QB situation isn't much to talk about here. Geno Smith should be the starter, and I don't think he's going to be all that great this year. He's a rookie, he's going to go through a lot of struggles, which isn't necessarily a bad thing. I'm interested in seeing how he performs this year, but don't expect too much. The advanced defensive schemes might be too much for him to handle, and his complete lack of weapons will hinder him. The best hope is that he gradually gets better as the year goes along, and figures out what he needs to improve upon for the next year. If Smith ends up being flat out horrible, or if he gets hurt. I do think that Matt Simms has some potential. As for Mark Sanchez, he's going to be a total non-factor. Even if Smith gets hurt I doubt Sanchez is getting a chance to start. The team knows it's not going to work out with him. He's pretty much going to be the fourth guy on the depth chart. Fourth? What happened to third? Brady Quinn happened. As for the running backs, nothing here inspires me that much. Chris Ivory has some talent but injuries have been a major issue since he's come into the league. I don't know what to make of him, maybe he won't even be good when healthy. Bilal Powell is nothing special. The most intriguing player here is Mike Goodson. Once he comes back from suspension, he might finally realize his potential that people have been speaking of for years. Not that I think Kellen Winslow has that much left in the tank, but I think he's going to be a crucial part of this offense. Geno Smith is going to need a security blanket to throw short check down passes to, and the tight end is usually the one to fill that role. Konrad Reuland may develop into a decent guy. As for the offensive line, the most important player is Brian Winters. As we've seen in the past, most notably Wayne Hunter, one weak link on an offensive line can cause the whole line to look awful. Third round pick Winters looked decent this preseason, so if he can continue this success in the regular season, he will make Geno Smith's life a lot easier. I really like this defensive line. Mo Wilkerson developed into a really good run defender last year, one of the best at his position. He needs to work a little more on his pass rushing, which would turn him into an elite player, but I like him as it is. That's because Sheldon Richardson will be really good in both pass and run defense this year, no matter where he plays, on the interior or on the edge. Kenrick Ellis is also a pretty good run defender. I've enjoyed Leger Douzable this preseason, he has a high motor and was almost always near the quarterback. Quinton Coples is going to see some time with his hand on the ground and playing as a rush linebacker, and either way he should do a pretty nice job at getting to the QB. The best part is that all of these guys are pretty young, meaning that at least the front of this defense will be interesting for years to come. David Harris used to be a great linebacker, but his play has significantly dropped off recently. I don't know what to make of him coming into this year. Demario Davis is a young player who should improve, I guess. There's really nothing else of note here. God this is painful. With Darrelle Revis gone, the Jets decided to take his heir apparent in the first round in Dee Milliner. I like his tools, and time will tell if he's a good NFL player or not, but I think he will be. 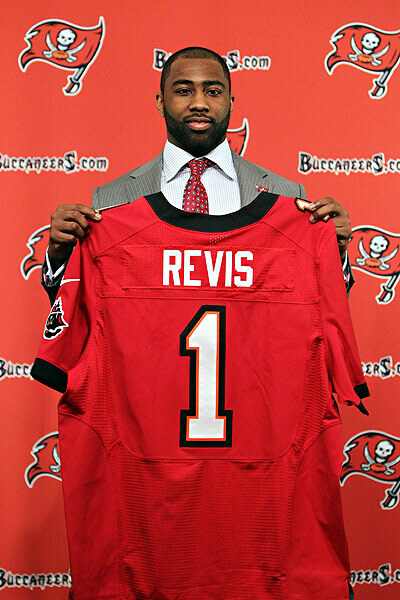 Obviously he will not be the historically great Revis, but I think he can be a really good #1 corner. For now, he only has to focus on the second best receiver on each team because Antonio Cromartie has been really good. He stepped up nicely when Revis went down. They will form a pretty nice 1-2 punch. Other than that, the secondary is completely average. Kyle Wilson is in my doghouse, and this is his last chance. Isaiah Trufant and Darrin Walls have some potential, but I don't know if they're going to do much this year. Safety Antonio Allen is terrible, and he's going to soon lose his job to Jaiquawn Jarrett (I still can't spell his first name). Dawan Landry is a pretty good safety, but again, nothing special. They stupidly cut Dan Carpenter and allowed Nick Folk to keep swinging his inconsistent leg around New York this year. Whatever. Robert Malone is a punter. Well, that's pretty much all my analysis, he was the definition of average last year. An average punter, could there be a less interesting player in the NFL? Jeremy Kerley is a pretty nice punt returner, and now that Joe McKnight is gone, it seems that Clyde Gates will be the one returning kicks. He's really fast, so I'll be interesting in seeing what he can do. Look, the defense is fine. They will be fine at worst, and if everything breaks well, they may creep up into the top 7-10 in the league. That's cool and all, but where are the points coming from? Other than Cromartie pick 6s, Kerley punt returns, and causing safties, I don't understand how this team will score. They face the Raiders at home on December 8, which is the second time in my life they've played the Raiders on the week of my birthday, the first time in 2005. The starters? Brooks Bollinger for the Jets and Marques Tuiasosopo for Oakland. Worst part, I went to that game. Guess what? We're back to that point, they both stink. 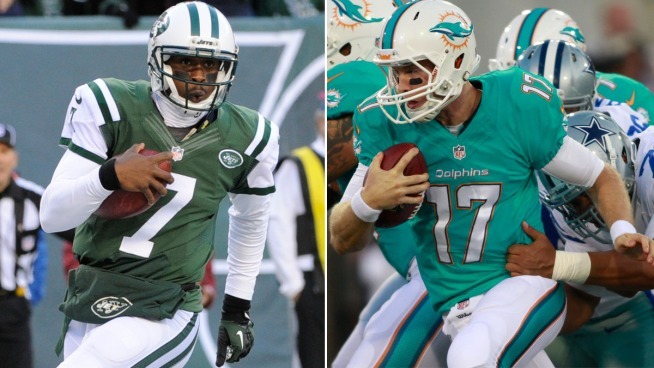 (To be fair, due to injuries, the Jets played 5 different QBs in that awful 2005 season). That's a win, and Buffalo will hand them a game at home. I see them scrapping out at most four other games throughout the season, but even that is wishful thinking.